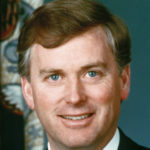 Dan Quayle is an American politician and lawyer who was the 44th Vice President of the United States from 1989 to 1993. He was also a U.S. Representative (1977–81) and U.S. Senator (1981–89) from the state of Indiana. A native of Indianapolis, Indiana, Quayle spent most of his childhood living in Paradise Valley, Arizona, a suburb of Phoenix. He married Marilyn Tucker in 1972 and obtained his J.D. from the Indiana University Robert H. McKinney School of Law in 1974. He practiced law in Huntington, Indiana, with his wife before his election to the United States House of Representatives in 1976, aged 29. In 1980 Quayle won election to the Senate. "I have a very good family. I’m very fortunate to have a very good family. I believe very strongly in the family. It’s one of the things we have in our platform, is to talk about it." "I believe we are on an irreversible trend toward more freedom and democracy – but that could change." "I do have a political agenda. It’s to have as few regulations as possible." "The other day the President said, I know you’ve had some rough times, and I want to do something that will show the nation what faith that I have in you, in your maturity and sense of responsibility. He paused, then said, would you like a puppy?" "The Holocaust was an obscene period in our nation’s history. I mean in this century’s history. But we all lived in this century. I didn’t live in this century." "It’s a very good historical book about history."